South African airmen Pilot Officer Stanley John Daly Robinson and Acting Pilot Officer Jack Elliott Thomas were both killed when their Blenheim crashed during a training exercise 30 January 1939. Cunningham (2006) says the bodies of the airmen were found some distance back along the line of flight of the Blenheim, suggesting the men had baled out but alas were too close to the ground to have chance to deploy their parachutes. Photo taken last May after a chilly night out on Bleaklow. I had taken a bearing from my bivi site and tramped across the moor in the darkness, planning on catching the first of the sunlight. However I hadn’t reckoned on how long it would take the sun to get high enough in the sky for its rays to touch these engines, which are in a bit of a hollow. As I lay in the heather beside the crash site waiting for the spin of the earth to do its stuff (it was an hour before the shadows disappeared) I noticed someone coming up the moor towards me. It would have been a surprise to see another person anywhere on Bleaklow at 5 o’clock in the morning but to be at that particular spot, which is well off the beaten track, was very unusual. But sure enough Flickrer symbianos07 (Jason) was out on an early morning walk, planning on photographing this particular crash site. I wondered what he must have thought, seeing me lying there in the heather, watching his progress; he said it would have been funny if he’d been dressed as an RAF airman…! I do remember years ago seeing something on telly about some blokes who had gone onto the moors to look at wreckage and them having seen a ghostly figure of an airman. It was foggy of course as it always is in these tales. Great shot. What’s with the soil behind the engines? It looks disturbed, like a tractor drove through. Like always I’m still amazed at the amount of wreckage remaining. The front part looks like "R2D2" . Fabulous light and excellent info. Well done you. I’m also surprised at the amount of wreckage too (not that I am an expert) Interesting story as always. Many many years ago, when I was young (blimey how long ago was that?!!!) I scared the life out of a couple of kids (he he) I had me trusty tommy tin helmet and camoflage jacket on – wandering out of the fog! Shame about the lack of footie – perhaps you’ll watch tennis instead!!! Thanks everyone. R2D2… aye, see what you mean Malcolm! For more on ghost stories please see the comments under this photo. Andrew I think it was from the crash site above where someone once took a piece of wreckage home and put it in thier garden shed, which almost shook itself to bits during the night, so the bloke who’d taken the debris returned it to the crash site the following morning. I think it’s nonsense myself, but if it deters people from robbing these places maybe I should promote the validity of these tales! Re; Wimbledon. Aye, maybe… Come on Tim! Cheers Keith. That’s the erosion of the peat by rainfall over the years leaving exposed heather topped peat. Nearer the top of the featureless plateau where drainage is less fluid, there are groughs (pronounced ‘gruffs’) which can be several metres deep and form narrow channels. These can make navigation across the moors difficult, as it can be tempting not to follow the straight line of a compass bearing but opt instead for easier walking along the sandy bottom of the channel, which soon makes any compass bearing worthless. This photo (my first visit to this site in low cloud) shows some fragments with similar exposed peat. I recall you telling me this tale Ian , great story it is too . 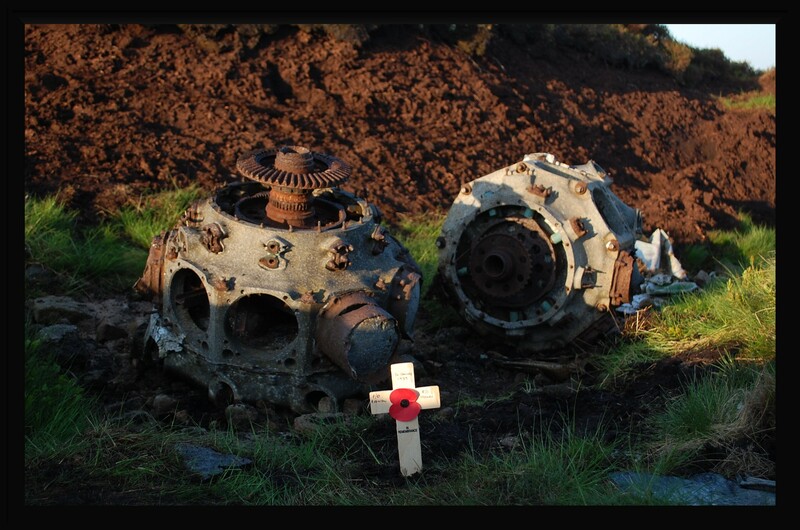 Its a very interesting crash site , with the engines and the memorials there . Pats ghost story book is worth a read sometime ……I truly hope those that steal wreckage from these places are haunted by it . great to have a fellow enthusiast randomly appear in such an out of the way spot. looks a very bare and lonely place to hit. fantastic that you have a history of your own, visiting these places and returning over time. Your other correspondants have asked all the questions I had, so I will just look in amazement at your continued finds! Sad tale Ian…. bless you for helping us to remember. As for your unexpected company, I’d have been running the opposite way at that time of the morning. Some great light on the poppy Ian, nicely done. Reckon somebody wondering out the mist at 5 in the morning near to one of these sites would get my ticker doing overtime. Agree with SolarScot re yesterdays events. really nice shot ian 🙂 i love the peat colour with morning / evening sun on it ,such a contrast to when its cloudy and wet, it being almost black then.. when i was heading upto that crash site and saw in the distance what appeared to be a figure a few times i thought no it must be some sheep or something it carnt be another person at this time just carry on .and if it would have been along torside clough at that time in the morning seeing a figure NO WAY! id proberbly abandon it and quickly turn around with "Bleaklow Lad" thoughts in my mind , but to my surprise it was fellow wreck enthusiast ian , nice meeting you there ian at that early hour ,i find the moors are quite peaceful early morning……Re bleaklow ghostys i recently saw on youtube a image showing a figure behind some of the udercarriage struts at the b29 prob one his m8s but they claim other. Thanks Paul, I should read Pat’s book. It’s odd he should write a book about crash site ghosts as he so objects to people referring to them, at least seriously. Yes a sad losses indeed, three crew dead. They have yet to be named. [http://www.flickr.com/photos/23802253@N07] Lol, thanks for that Jason. It was very good to meet you too. I was thinking, he must be coming here, there’s nothing else out here except this place… But I hadn’t slept all night so it did cross my mind I might be hallucinating! Thanks for the link by the way, that really is creepy! [http://www.flickr.com/photos/maycontaintracesofnuts] I suspect that Pat wrote it with tongue firmly in cheek ! Its a good read although i did see the end coming fairly early in the book ! Nicely done Ian. The sunlight was worth the wait. Great shot! Thanks for the history bit too! Quite an image Ian and story too. Beautifully composed but how sad that these young airmen lost their lives in such a tragic way. Striking view of these engines… Very good photo in warm morning light. Good to see there’s a memorial erected on the crash site. All that rusty wreckage seems to mirror the peaty hues behind it.Funny who you can bump into isn’t it ? Wonderful photograph Ian – nicely composed and rich colours! Interesting light on the poppy, with it being only partly lit by the rising sun might represent the untimely death of these two airmen.